"Court hears first traditional native oath"
For the first time in Brantford, a Mohawk man called to testify in court has taken a native oath instead of the traditional swearing-in process. 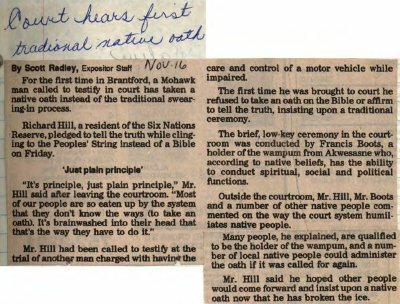 Richard Hill, a resident of the Six Nations Reserve, pledged to tell the truth while clinging to the Peoples' String instead of a Bible on Friday. "It's principle, just plain principle." Mr. Hill said after leaving the courtroom. "Most of our people are so eaten up by the system that they don't know the ways (to take an oath). It's brainwashed into their head that that's the way they have to do it." Mr. Hill has been called to testify at the trial of another man charged with having the care and control of a motor vehicle while impaired. The first time he was brought to court he refused to take an oath on the Bible or affirm to tell the truth, insisting upon a traditional ceremony. The brief, low-key ceremony in the courtroom was conducted by Francis Boots, a holder of the wampum from Akwesasne who, according to native beliefs, has the ability to conduct spiritual, social and political functions. Outside the courtroom, Mr. Hill, Mr. Boots and a number of local native people commented on the way the court system humiliates native people. Many people, he explained, are qualified to be the holder of the wampum, and a number of local native people could administer the oath if it was called for again. Mr. Hill said he hoped other people would come forward and insist upon a native oath now that he has broken the ice. Hill, Richard ; Boots, Francis. Public domain: Copyright has expired according to Canadian law. No restrictions on use.